Abraham Levin, like his better known compatriot Morris Hirshfield, emigrated to the United States from Lithuania and found employment in the garment industry. Bored and eventually disgusted with his mind-numbing job sewing “knee pants,” he started making pencil sketches and, at the age of 57, turned to painting. 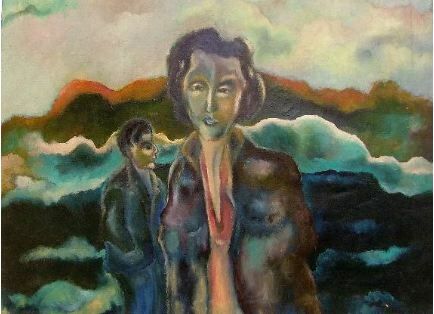 Encouraged by his teacher at a WPA art class in the Bronx community where he lived, he brought his work to the Uptown Gallery in Manhattan, which gave him his first show in 1941. Several exhibitions at the Galerie St. Etienne followed in quick succession. Initially, Levin was hailed as a great “find;” The New York Times called his first exhibition “a thrilling experience.” Critics responded strongly to the elements of his intuitive style that evoked Cezanne, Braque and Chagall. The Amalgamated Clothing Workers Union sent their own critic to evaluate his work and then granted him a $25-a-week stipend that enabled him to paint full time. However, the dovetailing of folk art and modernism, which in the early 1940s still seemed cogent, began to lose support as the decade progressed. In the end, Levin was forced to beg the union to return to his old garment-industry job.